The full name of this diet is The Carbohydrate Addict's Diet. It calls for high protein intake and recommends eating a lot of chicken, fish, meat, and eggs. Additionally, it recommends eating a lot of dairy and vegetables. Dr. Rachel Heller and Dr. Richard Heller, wife and husband, created this weight-loss diet. This diet suggests that carbohydrates are not good for humans and should only be consumed during one meal in order to indulge in and satisfy carbohydrate cravings. It also states that the one meal during which carbohydrates can be consumed should be the reward meal that is allowed on a daily basis. However, this meal must be eaten within sixty minutes. Overall it does does not completely eliminate carbohydrates in the same way as many other weight loss diets. Therefore, dieters who crave carbohydrates might do well with this type of diet and find this weight loss diet useful compared to diets like Atkins that seek to eliminate carbs altogether. However, people that crave carbs all the time might not be satisfied, as the Carbohydrate Addict's Diet was intended to help those who cannot entirely eliminate carbohydrates from the diet since it allows them to be consumed once a day. Although this is not considered an extreme diet since foods are not very restricted or limited, it is not nutritionally balanced. However, due to limited restrictions being in place, food cravings are usually held in check or decreased. Some opponents of this diet believe that it includes too much sugar and fat to allow for much weight loss. Selecting lean cuts of fish and meat as well as consuming large quantities of green vegetables might be helpful in reducing the high calorie intake. Since individuals who crave carbohydrates and sugars to an extreme level can be referred to as carbohydrate addicts, this diet is referred to as The Carbohydrate Addict's Diet. In fact, it has been noted that individuals who still feel hungry after ingesting a meal often crave carbohydrates and sugars and can also be considered carbohydrates addicts. Throughout this weight loss diet, dieters are encouraged to include fat and protein during every meal that is eaten during daylight hours. However, snacking in between meals is discouraged. 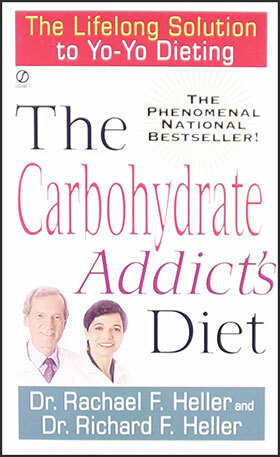 Buy Carbohydrate Addict's Diet Books from Amazon.com.